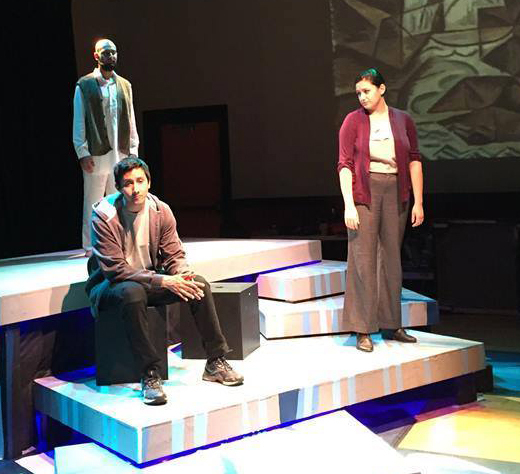 Wisdom Tooth Theatre Project likes to present thought-provoking plays, and “Water by the Spoonful” definitely digs into your noggin. Marine veteran Elliot (Mauricio Miranda) and his cousin Yazmin (Elysia Rohn) find themselves dealing with the death of her mother and his aunt, the woman who raised them. It doesn’t help that he is also shadowed by the ghost of a man he killed in Iraq (Sunny Arwal). Meanwhile, Elliot’s biological mother, Odessa (Dena Toler), has become “Haikumom,” the admin for an online forum for fellow recovering crack cocaine addicts. She keeps the peace as the harmony between her, Chutes&Ladders (Butch Copeland) and Orangutan (Tracy Herring) is disturbed by Fountainhead (Scott Russell), a man clearly not being honest with anyone, especially himself. What is presented as a simple family and relationship drama gains a number of layers as our characters deal with their demons, confront truths and test how far they would truly go for each other – to the hospital? To Japan?And are some acts truly beyond forgiveness, beyond redemption? These questions, and how the characters struggle to answer them, echo beyond the play’s curtain call. The title refers to events in Elliot’s childhood that led to his being raised by his aunt, and a lifesaving act that takes place one small spoonful at a time – a process those in recovery understand all too well. This cast is strong and believable. Toler is beautifully tragic; Miranda keeps Elliot’s emotions at a low boil throughout, helping us feel his pain; Russell makes us dislike, then admire his conflicted character; Copeland and Herring get us rooting for their unlikely yet inevitable friendship; Atwal is the glue of the plot; and Rohn perfectly embodies the person who is involved in the story, yet feels like a bystander because she is not an addict herself. “Water by the Spoonful” has two more weekends at the IndyFringe Basile Theatre, 719 E. St. Clair St., Indianapolis. Get tickets at indyfringe.org or wisdomtooththeatreproject.org. You’ve heard the phrase, “generous to a fault” – now see the consequences play out in Casey Ross Production’s “Timon of Athens” during the Bard Fest Shakespeare Festival in downtown Carmel. In Shakespeare’s least-produced play, which, having elements of both his comedies and tragedies, Ross considers a black comedy, Athenian nobleman Timon (played by Brian G. Hartz) lavishes his wealth on friends and hangers-on, overpaying for art and giving to all who ask – or even don’t ask, but are there to receive it. Only his steward, Flavius (Colin McCord), sees the danger of Timon’s dwindling fortunes. And only the self-denying philosopher Apemantus (Carey Shea) refuses to accept any gifts, making him the only one Timon is suspicious of, rather than the leeches at his banquet. When Flavius finally gets through to Timon, the nobleman is broke – even his lands are forfeit. The “friends” who received so generously will give him nothing, so a disgusted Timon leaves the city to live in the wilderness. Even the discovery of a cache of gold does not make Timon happy, other than his mad glee to use the found fortune to curse Athens while keeping nothing for himself. 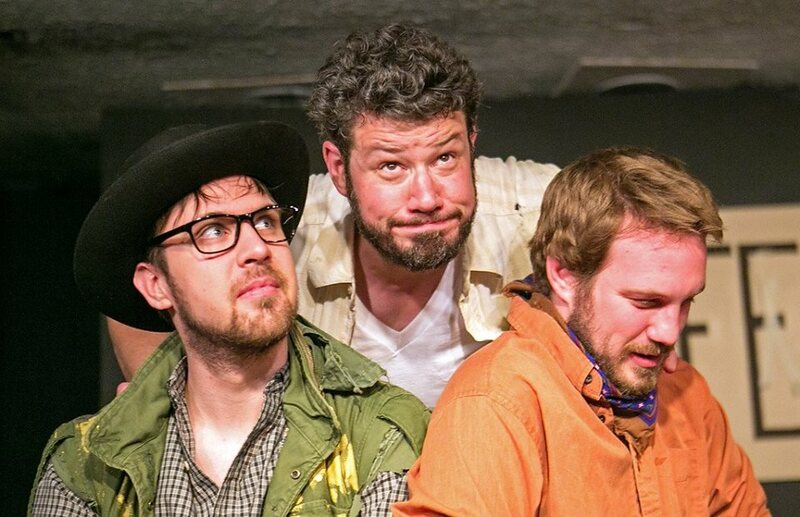 Hartz is in his element with this complex character, keeping him easy to root for as both the generous noble of the first act and the wild man in the woods of the second. Shea is a worthy foil; McCord is sharp as the faithful servant; and Tristan Ross takes on yet another Shakespeare role with ease as the exiled Athenian general Alcibiades. Notable are Bradford Reilly and Taylor Cox as the painter and poet who seek Timon’s patronage for a life of leisure, but all are well cast, including Tom Weingartner, David Mosedale, Allyson Womack and Minnie Ryder. As both parable and intriguing drama, “Timon” is worth making the effort to see, and kudos to Ross for tackling the difficult job of polishing this rare gem. Upcoming performances are 8 p.m. Friday; 2 p.m. Sunday; 8 p.m. Thursday, Oct. 15; and 8 p.m. Saturday, Oct. 17. The festival also hosts performances of the comedy “As You Like It” by First Folio and the tragedy of “Othello” by Garfield Shakespeare Company. In addition, Ross hosts Shakespeare trivia contests during the festival, as well as a performance of her latest Fringe play, “Hell’s 4th Ring: The Mall Musical” at 11 p.m. Saturday, Oct. 17. The stage is located at 15 First Ave. NE in the Carmel downtown Arts and Design District (former location of Carmel Community Players). For information and tickets, visit the the Carmel Theatre Company website.